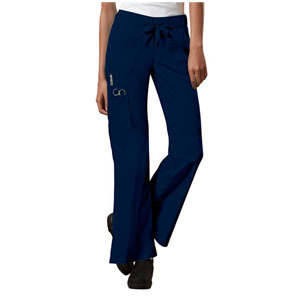 A Junior fit low-rise, flare leg pant features a knit waistband with encased elastic and an adjustable drawstring. Also featured are patch pockets, a sectional cargo pocket, two back patch pockets, a back leg seam, double needle topstitching, and side vents. Inseam: 34"